LG KF300 (Wine). LG KF300 is actually the world market version of the LG Wine model, which we saw launched in Korea back in May 2007. 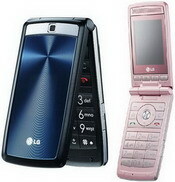 With the new (upcoming) device, LG will target the lower end of the fashion phone market. LG KF300 Wine looks like a budget fashion phone, which may be a nice addition to an already popular LG Chocolate and LG Shine brands. LG KF300 comes with a front display hidden behind glassy mirror surface, unusual application quick access buttons beneath the main display, black/red (actually pink) color schemes and a little better camera - 2Mpx with autofocus, instead of a lame 1.3Mpx on a Korean version. 0 comments on "LG KF300 (Wine)"